For the film and television narrative technique, see Cutaway (filmmaking). A cutscene or event scene (sometimes in-game cinematic or in-game movie) is a sequence in a video game that is not interactive, breaking up the gameplay. Such scenes could be used to show conversations between characters, set the mood, reward the player, introduce new gameplay elements, show the effects of a player's actions, create emotional connections, improve pacing or foreshadow future events. Cutscenes often feature "on the fly" rendering, using the gameplay graphics to create scripted events. Cutscenes can also be pre-rendered computer graphics streamed from a video file. Pre-made videos used in video games (either during cutscenes or during the gameplay itself) are referred to as "full motion videos" or "FMVs". Cutscenes can also appear in other forms, such as a series of images or as plain text and audio. The term "cutscene" was coined by game designer Ron Gilbert to describe non-interactive plot sequences in the 1987 adventure game Maniac Mansion. 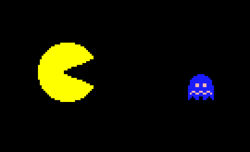 Pac-Man (1980) is frequently credited as the first game to feature cutscenes, in the form of brief comical interludes about Pac-Man and Blinky chasing each other, though Space Invaders Part II employed a similar technique in the same year. In 1983, the laserdisc video game Bega's Battle introduced animated full-motion video (FMV) cutscenes with voice acting to develop a story between the game's shooting stages, which became the standard approach to game storytelling years later. The games Bugaboo (The Flea) (1983) and Karateka (1984) helped introduce the cutscene to home computers. Other early video games known to use cutscenes extensively include Portopia Renzoku Satsujin Jiken in 1983; Valis in 1986; Phantasy Star, Maniac Mansion, and La Abadía del Crimen in 1987; Ys II: Ancient Ys Vanished – The Final Chapter, and Prince of Persia and Zero Wing in 1989. Since then, cutscenes have been part of many video games, especially in action-adventure and role-playing video games. Cutscenes became much more common with the rise of CD-ROM as the primary storage medium for video games, as its much greater storage space allowed developers to use more cinematically impressive media such as FMV and high-quality voice tracks. Live-action cutscenes have many similarities to films. For example, the cutscenes in Wing Commander IV used both fully constructed sets, and well known actors such as Mark Hamill and Malcolm McDowell for the portrayal of characters. Some movie tie-in games, such as Electronic Arts' The Lord of the Rings and Star Wars games, have also extensively used film footage and other assets from the film production in their cutscenes. Another movie tie-in, Enter the Matrix, used film footage shot concurrently with The Matrix Reloaded that was also directed by the film's directors, the Wachowskis. Pre-rendered cutscenes are animated and rendered by the game's developers, and take advantage of the full array of techniques of CGI, cel animation or graphic novel-style panel art. Like live-action shoots, pre-rendered cutscenes are often presented in full motion video. Real time cutscenes are rendered on-the-fly using the same game engine as the graphics during gameplay. This technique is also known as Machinima. Real time cutscenes are generally of much lower detail and visual quality than pre-rendered cutscenes, but can adapt to the state of the game. For example, some games allow the player character to wear several different outfits, and appear in cutscenes wearing the outfit the player has chosen. It is also possible to give the player control over camera movement during real time cutscenes, as seen in Dungeon Siege, Metal Gear Solid 2: Sons of Liberty, Halo: Reach, and Kane & Lynch: Dead Men. Many games use both pre-rendered and real time cutscenes as the developer feels is appropriate for each scene. During the 1990s in particular, it was common for the techniques of live action, pre-rendering, and real time rendering to be combined in a single cutscene. For example, popular games such as Myst, Wing Commander III, and Phantasmagoria use film of live actors superimposed upon pre-rendered animated backgrounds for their cutscenes. Though Final Fantasy VII primarily uses real-time cutscenes, it has several scenes in which real-time graphics are combined with pre-rendered full motion video. Though rarer than the other two possible combinations, the pairing of live action video with real time graphics is seen in games such as Killing Time. Interactive cutscenes involve the computer taking control of the player character while prompts (such as a sequence of button presses) appear onscreen, requiring the player to follow them in order to continue or succeed at the action. This gameplay mechanic, commonly called quick time events, has its origins in interactive movie laserdisc video games such as Dragon's Lair, Road Blaster, and Space Ace. Director Steven Spielberg, director Guillermo del Toro, and game designer Ken Levine, all of whom are avid video gamers, criticized the use of cutscenes in games, calling them intrusive. Spielberg states that making the story flow naturally into the gameplay is a challenge for future game developers. Hollywood writer Danny Bilson called cinematics the "last resort of game storytelling," as a person doesn't want to watch a movie when they are playing a video game. Game designer Raph Koster criticized cutscenes as being the part that has "the largest possibility for emotional engagement, for art dare we say," while also being the bit that can be cut with no impact on the actual gameplay. Koster claims that because of this, many of the memorable peak emotional moments in video games are actually not given by the game itself at all. It is a common criticism that cutscenes simply belong to a different medium. Others see cutscenes as another tool designers can use to make engrossing video games. An article on Gamefront calls upon a number of successful video games that make excessive use of cutscenes for storytelling purposes, referring to cutscenes as a highly effective way to communicate a storyteller's vision. Rune Klevjer states: "A cutscene does not cut off gameplay. It is an integral part of the configurative experience", saying that they will always affect the rhythm of a game, but if they are well implemented, cutscenes can be an excellent tool for building suspense or providing the player with helpful or crucial visual information. ^ Matteson, Aaron. "Five Things We Learned From Pac-Man". Joystick Division. "This cutscene furthers the plot by depicting a comically large Pac-Man". ^ Hancock, Hugh (April 2, 2002). "Better Game Design Through Cutscenes". Gamasutra. Retrieved November 19, 2014. ^ Aaron, Marcus (2014). Design, User Experience, and Usability. User Experience Design for Diverse Interaction Platforms and Environments. Springer. p. 662. ISBN 3319076264. Retrieved November 19, 2014. ^ Buecheler, Christopher. "The GameSpy Hall of Fame". GameSpy. Archived from the original on March 11, 2011. ^ Space Invaders Deluxe, klov.com. Accessed on line March 28, 2011. ^ Fahs, Travis (March 3, 2008). "The Lives and Deaths of the Interactive Movie". IGN. Retrieved March 11, 2011. ^ "Bugaboo, un hito en la historia del software español", Universidad de Extremadura, 2009, p.33. (Spanish). ^ "The Next Generation 1996 Lexicon A to Z: Cut Scene". Next Generation. No. 15. March 1996. p. 32. ^ "Killing Time". Electronic Gaming Monthly. No. 76. Ziff Davis. November 1995. pp. 142–143. ^ Rodgers, Scott (2010). Level Up! : The Guide to Great Video Game Design. John Wiley and Sons. pp. 183–184. ISBN 978-0-470-68867-0. ^ Mielke, James (May 9, 2006). "Previews: Heavenly Sword". 1UP.com. Archived from the original on June 4, 2011. Retrieved December 19, 2007. Some points in key battles (usually with bosses) integrate QTE (quick-time events), which fans of Shenmue and Indigo Prophecy might like, but which we've been doing since Dragon's Lair and Space Ace. Time to move on, gents. ^ Chick, Tom (December 8, 2008). "A Close Encounter with Steven Spielberg". Yahoo!. Archived from the original on August 7, 2011. Retrieved December 11, 2008. ^ Dutton, Fred (November 17, 2001). "Del Toro, Levine speak out against cutscenes". Eurogamer. Retrieved November 19, 2014. ^ Brown, Nathan (September 3, 2011). "Bilson: Cutscenes Are Gaming's "Failure State"". Edge Online. Retrieved November 19, 2014. ^ a b Sterling, Jim (November 3, 2011). "In Defense of the Videogame Cutscene". Gamefront. Retrieved November 19, 2014. ^ Koster, Raph (December 7, 2005). "The Pixar Lesson". Raph Koster's Website. Raph Koster. Archived from the original on October 7, 2008. Retrieved October 7, 2008. Well, that would leave the part that has the largest possibility for emotional engagement, for art dare we say, in the bit that can be cut with no impact to gameplay whatsoever. This is why I say that many of the peak emotional moments we remember in games are actually "cheating" – they’re not given to us by the game at all, but by cutscenes. ^ Holmes, Dylan (2012). A Mind Forever Voyaging: A History of Storytelling in Video Games. Dylan Holmes. p. 92. ISBN 1480005754. Retrieved November 19, 2014. ^ Klejver, Rune. "In Defense of Cutscenes". Retrieved November 19, 2014.